Machu Picchu or often referred to as the lost Inca city are the remains of the Inca-like civilization ruins. Located in a mountainous area with an altitude of over 2,400 meters, Machu Picchu is a symbol of the Inca kingdom built in 1450. Machu Picchu which is in the territory of Peru is only used for about a hundred years because at that time the Inca kingdom was conquered by Spanish troops. From now on, this place became forgotten until in 1911 an archaeologist rediscovered it and preached it to the world. Since then, this archaeological site became famous as an interesting and important tourist spot for the world. Today, most of the buildings in Machu Picchu have been reconstructed so that visitors can get a clearer picture of the life of the Incas. The building style here is an ancient Inca style with polished stone walls. This site has also been designated as an important world heritage by UNESCO. Machu Picchu located in Urubamba valley, 70 KM from Cusco is currently in danger of being damaged. In addition to natural disasters such as earthquakes and bad weather, the world's cultural heritage is also threatened by the many tourists who come. Therefore various ways have been done to keep Machu Picchu, one of them is to limit the number of tourists who come every day. With all its beauty and uniqueness, Machu Picchu is Peru's most famous, bustling, and most unique tourist spot. Many people say that Adna's visit to Peru is incomplete without visiting Machu Picchu. However, keep in mind that a trip to this sights can cost a fairly large. Trekking: Suitable for adventure lovers and outdoor activities. This trekking track offers beautiful scenery that is second to none in the world. Train: The world's highest rail car ride is a unique experience. Used trains are also specially designed to enjoy nature around Machu Picchu. The car has many glass windows, even the roof is also made of glass so you can enjoy every corner of your journey. If you want to visit during the rainy season (November to March), be prepared for schedule delays, as bad weather can hinder your departure, either by trekking or rail. Train ticket price to Machu Picchu is the most expensive train ticket price in the world when calculated from the distance traveled. In addition, Machu Picchu train tickets are often sold out, so it is advisable to book tickets back and forth before. There is only 1 hotel in Machu Picchu location, and the hotel is very expensive with prices ranging from USD 500 per night, includes 3x meals. Since this place is protected, most likely no other hotels will be built in this location. Due to its extremely expensive price, most people would prefer to stay at a hotel near Aguas Calientes, a small town near Machu Picchu. Machu Picchu is the most crowded in the dry season (June to August), and the loneliest at the height of the rainy season in February. All visitors must leave Machu Picchu at 5 pm. To be able to enter the location, you must buy a ticket first. This ticket will not be available at the entrance but can be purchased online. 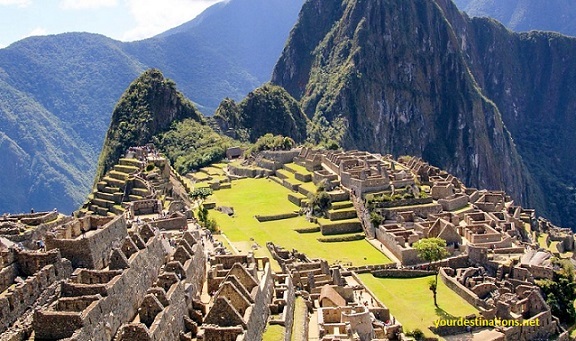 It aims to limit the number of visitors to keep Machu Picchu sustainability. Limit the number of visitors in 1 day is 2,500 people, therefore, order your tickets as soon as possible. Machu Picchu admission price is PEN 126, or about 520,000 Rupiah per person. Not allowed to bring food, drink, and walking stick. However, if you use a backpack, you can include drinking water and food into your rucksack, because your backpack will not be checked by the clerk. If you do that, do not litter! There are no vehicles in Machu Picchu area, therefore use comfortable shoes to walk. If you spend the night in Aguas Calientes, prepare yourself to bid the price, because all the prices in this city are very high. Bid price up to 50% of the starting price is normal. I am nothing, but trying to be what I dreamed of ... being a successful person in the world and heaven. Hope this all comes true ... amiin.